FAQ #44 What really happened during Noah's flood? FAQ #44 What really happened during Noah’s flood? What really happened during Noah’s flood? Turning to Genesis 7. We’re ready to take a good look at Noah’s flood, and I’m going to explode a lot of myths. There is a common picture that comes to mind when we talk about Noah’s ark. We immediately get the picture of a little rowboat type thing with a little shed in the middle and a giraffe standing on deck looking over the edge. That goes back to our Sunday School materials when we were kids, and shows you how impressionable young minds are. The ark was not just a little row boat. Instead, as we pointed out a few weeks ago, the ark was an enclosed rectangular box. It was built, not to sail across the sea – it wasn’t going anywhere in particular – but it was built to withstand the awful rigors of the flood. The secret of this is in Gen. 7:11. The only thing that probably 99% of the people who have read of this flood have considered was the 40 days and nights of rain. Years ago, as I was teaching this, I had several pastors in my class. After class, one came up and said, “Les, you just shot out of the saddle one of my best sermons!” I replied, “I’ll bet I know how you preached it. You said, `it rained, and the water got ankle deep, and somebody said, `Hey, old Noah was right,’ and they came knocking on the door. When it got knee deep, a few more woke up; when it got up to their waists, a few more. '” He admitted he always taught it that way. It made a great sermon but it wasn’t Biblical! They had no time to look for cover. It was instantaneous, absolute mayhem and cataclysmic destruction. The seven days referred to in verse 10 are those “seven days of grace” we mentioned in a previous lesson. After Noah, his family and the animals were all on the ark, the door was left open and the gangplank down and anyone who wished, still could have come in, but no one did. Then, God shut the door. “In the second month” – When months are mentioned in Scripture, April is considered the first month of the year, so this would have been the month of May. … “On the same day all the fountains of the great deep burst open, and the floodgates of the sky were opened.” Here is the secret. On one day everything hit and hit hard. It didn’t just begin to rain with water rising slowly (previously, in Genesis 1:6,7, we noted that after the earth was flooded during a previous judgment, not on man, but probably on an angelic kingdom. God was preparing it for human habitation). I’m of the conviction that at that point in His restoration, God raised half of the water that had been flooding the planet and placed it in a huge vapor belt somewhere out in space; that laid the foundation for the amazing spring-like weather that enveloped the planet from one end to the other. The earth had a constant spring-like climate, and because it was constant, there was no “weather;” no storm clouds; and the Bible can accurately say it never rained, but that God watered the things that needed water from beneath. In Genesis 7, as Noah was building the ark and started talking of a great rain to come, the people probably couldn’t understand what he was talking about. Even though as we have discussed, the technology of that day was fantastic, probably something equivalent to what we have today or more, yet they couldn’t comprehend water coming down from above because they’d never experienced rain. All of a sudden it began to rain all over the planet, and that was the first time the people probably began to give credence to what Noah had said. But before they had time to react to that thought all the fountains of the great deep were broken up. Analyze that for a moment. What do we usually think of when “the deep” explodes out above the surface? We call it a volcano. So if you can picture it in your mind, (and I’m going to get you to expand your imagination here as far as I can), all around this planet there were volcanic eruptions, and along with these eruptions there were gigantic earthquakes. This whole planet went into convulsions. There was no time to knock on Noah’s door. There was no time to find a high place or climb a tree. It was instantaneous judgment. And, it didn’t just last an hour or two; it continued for months and the whole planet was turned completely inside out by these tremendous acts of God. The problem with people (even believers), is that we fail to understand that with God nothing is impossible. God handling this old planet is like you or me handling a marble or ball bearing. It’s that simple in His power – He can do with it whatever He wants. He controls all the forces of nature and outer space, and this was all brought to bear in the early months of what we refer to as Noah’s flood. Remember years back, the old front-loading washing machines had a window in the door – and when the machine was started, you could see the suds and the clothing start to roll violently. That’s much the way the earth would have looked as Noah’s flood started. It was complete turmoil. We have plenty of archaeological proof for this. In fact, if you get into a study of the flood, all around the earth you’ll find a soil product called “loess” which comes solely from volcanic action. In every place on this planet there has been laid down, (even on our ocean floors), a tremendous amount of “loess,” and the only logical time that this could have been laid down is during the flood, with all its volcanic action. Along with the flood, we also have a disappearance of much of the land surface of the pre-Noah time. We believe that the land surface of the earth from the time of Adam until the flood of Noah’s day, was much larger than it is today. Seventy-five percent of the earth’s surface is water today. Only a small portion of it is land, and only a small percentage of that land surface is habitable. Most of it is uninhabitable. Up until the time of Noah, the earth was beautiful, tremendously productive with vegetation beyond our imagination, and highly populated. I have a friend who was in the space program back in the 1960’s. He and a friend of his calculated how many people could have been here from the time of Adam until Noah (about 1600 years). They had an easy mathematical time approaching four to five billion people. The reason for that (and we’ve witnessed this in recent years) is once you get to a certain level, population doubles. Once it doubles, it begins to grow exponentially – to just explode. So, we can be confident that at the time of Noah’s flood, the earth was highly populated and had tremendous technology. But when the flood came, there was no time to escape. It was complete and instantaneous, and for that reason there is not much evidence of the things before Noah’s flood except in fossil records. And the only logical way to view the fossil records, is that they are a direct result of the flood. Scientists are going to scoff at this. Paul is saying, “Timothy, watch out for the false sciences.” True science never disagrees with Scripture. True science and Scripture always fit “hand in glove.” But, it’s these false sciences, the man-made sciences, that cast all the belligerent reflections on the Word of God. They are not true sciences. The reason some sciences are false and not true sciences is that, in them, everything is based on what man thinks. They can actually prove nothing in the laboratory. Compare that to mathematics, which is a true science, because you can never change the makeup of true mathematics. You cannot change the true workings of physics or chemistry, either. But a geologist can come along and say, “Well, we think `such-and-such’,” and then the next generation comes along and they are taught that theory as a truth or absolute fact. I’ve got no argument with theory. If someone wants to come up with a bizarre theory, and he will tell his students in the classroom that it is “strictly theory – we can’t prove it,” then I don’t object to that. I’ve even told kids in high school classes, “if your teacher makes it plain that what he’s teaching is simply some man-made idea, and that it’s only `theory’, I’m not going to complain.” But, educators usually come in and say, “That’s the way it was,” and I have a problem with that. Public television programs such as “Nova” are very interesting, but gullible people believe everything that’s said. You can only determine so much from fossil records. The rest is interpolation and assumption. Here’s good example. Go into any basic college geology course and the first thing they throw at their students is a “geologic column,” an “evolutionary geologic column” or time scale. They teamed up with evolutionary biologists and have divided the structure of the surface of the earth into various strata which they associate a particular time period with. That time period is dependent on the fossils found in that one strata. If near the bottom they have found a very simple life form, they maintain that that is the oldest rock on the earth, it’s the farthest down from the top, and consequently, the very earliest of life forms are found in this layer. Then, as they find in higher strata … say, reptiles, they say, that naturally you’ll find them throughout all the earth’s structure in this level, and it’s the next higher form of life, because its “evolved” from those simplest of life forms into the reptile. The next up from reptiles is, I believe, birds, and so on up that geologic column. All that sounds so believable, because as wind and erosion, etc. pile this material up, naturally the oldest would be at the bottom, and at the top would be the fossils of man. It all sounds so logical. But, what they don’t tell people is that nowhere on earth have they ever found these fossils in this clear order. Never! They are all mixed up. Granted, there may be levels of sandstone or rock of some kind, with only primordial forms. But, it’s not on the bottom! It may be way up on top! 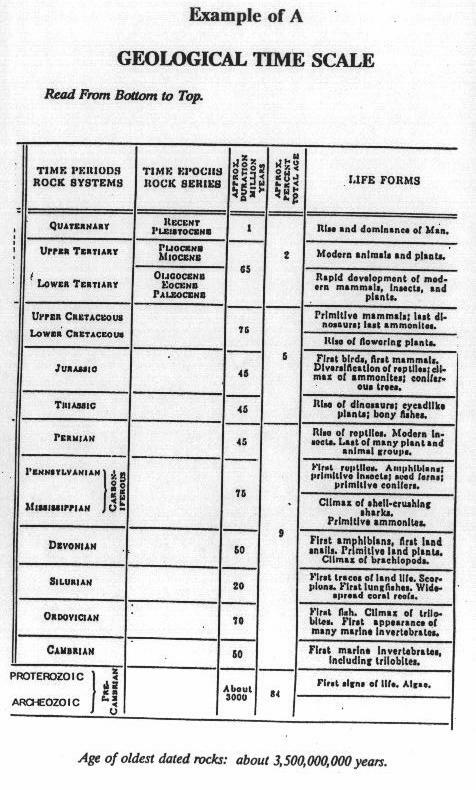 Study the Geological Time Scale Example A on the next page. Verse 2 refers to “words spoken beforehand by the holy prophets” or the Old Testament. Verse 3 says we should “know” or expect that there will be those who will mock and scoff at Biblical truths. And, as we discussed a few chapters ago, these people are “willingly ignorant,” as it says in verse 5, they do not want to know any different, they won’t listen to anything different than what they are teaching. If you were to speak to a geology professor and point out that the theories he purports as truths have discrepancies because things just aren’t consistently as he says on the earth’s surface, they are all mixed up in various levels; and that you believe it was Noah’s Flood, he’ll just laugh at you, because he doesn’t want to believe that there was ever a flood. We know from the chronological record, that Noah’s flood could not have taken place more than 5000 to 6000 years ago, and that blows their millions and millions of years theories `out of the water’! So, they totally reject Noah’s flood. You will never find a current college or university textbook on geology mention Noah’s flood; they totally reject and ignore it. This is where we come into the controversy of what is being taught our children. Some states have tried to pass laws that if schools are going to teach evolution, they also have to teach creationism; and the educators reject it, because it makes a fallacy of everything they are trying to teach our kids. What takes more faith? Believing something like evolution that is a figment of somebody’s imagination, or believing the true record? I believe it would take a lot more faith to believe the false than it does the true. We have to be careful and make our young people aware that science is not always honest. I remember when the U.S. astronauts were making the “moon walk.” The same friend I told you about earlier was involved in that project. If you’ll remember, before they went to the moon, they had one big fear of landing there – that they would sink into the dust. When they got there and found that that dust was only about twelve inches deep, the whole scientific community was so shocked that they immediately went to work building an instrument that they could place on the moon’s surface on the next trip, which would measure how much and how fast this lunar dust was collecting on the moon. They just couldn’t believe that there were so few inches of lunar dust on its surface, if the moon was billions of years old. They decided to make a special instrument to measure how much dust was filtering to the moon’s surface in a given period of time, and set it up on their next trip. When they went back the next time, they measured it and were aghast that instead of some infinitesimal, immeasurable amount, there was a fraction of an inch of dust, which indicated that the moon couldn’t be more than ten thousand years old, at the most! My friend told me that when the scientists got that information, they buried it, so that the public wouldn’t find out, and it remained hidden until just a few years ago, when in the Tulsa World, I saw a little article on the back page that gave that fact. The scientists didn’t want the public to know that, because, it simply blew their theories of millions upon millions of years being involved in the evolution of our solar system. So, this brings us back to the false, so-called “sciences.” We have to take them with a grain of salt. The entire scientific community tonight will not recognize Noah’s flood, because it totally changed everything so that the history of this planet, instead of going back millions and millions of years, in actuality, goes back to Noah’s flood. Even carbon 14 dating cannot be accurate beyond the flood, because it is based on a continuous degeneration under continuous circumstances. Those continuous circumstances were interrupted at Noah’s flood. The whole planet was wrapped in volcanic ash and volcanic smoke from the center of the earth; along with that, there was a deluge of the water, that totally changed the face of the planet. If you’ve ever seen pictures of what a rampaging river flood can do, taking everything in its path, you’ve got a glimpse of what was taking place on the entire surface of the planet. There was total destruction from pole to pole; and from East to West. No one knew what hit him! In our next chapter, we’ll look at some things that archaeologists can’t explain. If they’d just give the flood the credit for it, they’d have all their questions answered. FAQ #52 What is the origin of the customs and traditions associated with Christmas, Easter, and April Fool’s Day? FAQ #43 Can a TRUE Christian fall from grace?